I am struck by the flu, feeling awefull. But just have to get through it and in a few days I will be back. Pfew, I am glad I can sit and relax. Yesterday was a full day for me, in the morning the language class and in the afternoon the first training. The class in the morning was nice, and this time we had a whole group of 9. That is how it should be every time. I did had time to go home and have something to eat and then had to leave again for the training. It was easy to find, and as I always try to do, I was on time( some time before, actually). Big building, and a kind of labyrinth to find your way. But we all found our classroom and first thing to do was making a little card with our name written on it. It was a rather large group, I think there were abot 15 people. Most of them were in the age of 45-65. Seems a nice group to me. The "teacher"was a yound lady, who did it very well. We already had to do some tasks during the class, which went very well. Only thing I regret a bit that it was kind of theoratical, but may be that was only the step, I hope to have more "practical" tips and perhaps excercises in the next times. I think I've even made some "intelligent"remarks during the class LOL! But at the end end of the day I was glad to go home. It all ended around 16,00 hours, and because the weather was nice, I decided to walk home. all together it isn;t too far, just about half an hour. Home again I could sit for a moment and tell Jan a bit about it. Then it was time for dinner preparatin, and I had something that was easy and quick. Yeah, I had thought about it in advance, hahaha. Then finally I could put on my sweat pants and a comfy sweater and sit down and relax. Gosh, I really was feeling a bit tired, but understandable, I was up at 7 a.m. that day and that is early for me! This morning I had no chance to post on my blog, because I had an appointment at the hospital, my yearly control for my epilepsie. It was even nicer weather today, so I walked to the hospital, about 20 minutes walk, in very moderate pace. And of course the doctor had a delay of her consultation of around 20 minutes. That happens all the time. Still not too bad and once in her room I was out very quickly. Nothing special t talk about, but she wanted to have a new blood sample of me(last check was in 2012) and after the consultation I straight went to the blood collection and I was lucky. Had to wait only for a couple of minutes, so that was done quick. The doctor will phone me about the result in a week or two. And then I walked home again. Why not, sun was shining and temperature was nice. On the way home I made a little detour do a few errands and then arrived home at noon. And I have done walking now for a while, gosh! Got me a cup of coffee and then really felt I needed a nap. So I did and now I am feeling all fine again. Probably today will be the last really nice day, weather will change over the weekend and temperatures will drop drastically to about 53-56 F. That isn;t nice!!! But there is nothing we can do about it, only hope it will not last too long and that soon we will have back some nice warm weather, that will last for quite some time. Last thing to do now is posting the freebie for you. 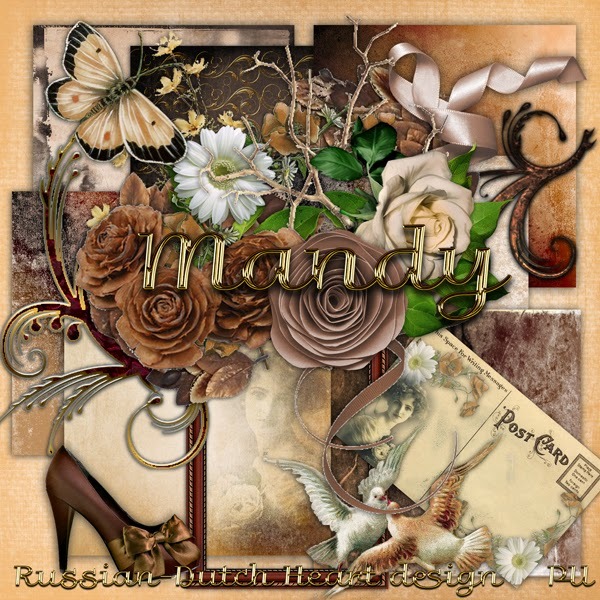 This time a kit named "Mandy". ope you will have some fun with it. Have a wonderful weekend, safe and sound! More or less a free day left. do some small things in the garden and even sit for a moment in the sunshine. Today there are a few things left I want to do, because tomorrow my day is fully spoken for by the language training. Pff I start at 9.30 morning till 11.30, then have about an hour to go hme and have something to eat or whatever then have to leave again at 13.00 to be at the training from 13.30 till around 16.00. Then home, relax for a moment, make dinner and then install on the couch . Friday I probably will be posting later, because in the early morning I have an appointment with my neurologist, just the year follow up it is, nothing special. Then if she is home, I might be making a visit to heidi, to see how she is doing. She will be home today from hospital again, but I think she will be rather exhausted after all those researches they did on her, so probably will just give her a call later today. We will have one or two days more of lovely weather, with even nice temperatures, but then it seems it will go donw again for several days, and we even might get a few rain showers. well, we didn;t have much rain lately, so yesterday evening I gave all the pots a treatment with the hose, and i think they were happ with it LOL. I also took a peep into our little pond and I saw that we have a lot of tiny little frog-hatchlings in it. If all will survive, our little pond will be just too small for this overpopulation.! I really hope that today the sun will come quickly, for now it is clouded and looking somewhat disconsolate. It just changes your whole mood if the sun is shining, isn't it? 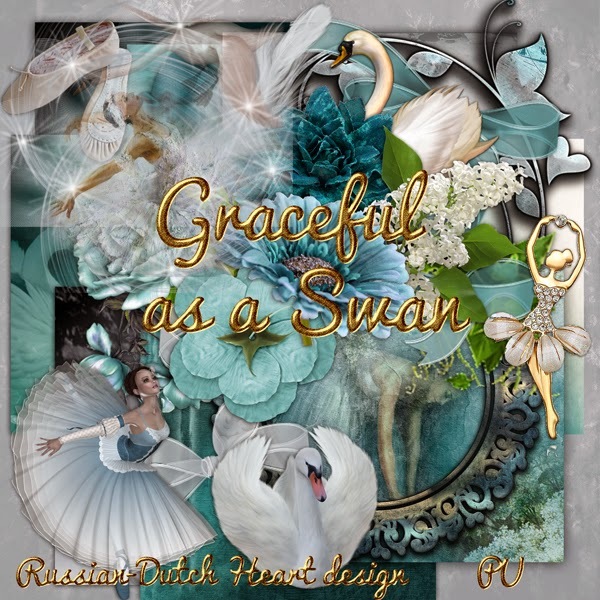 Today I have a freebie from Arlene, clusters ( 2 clusters and a beautiful quickpage) she made with the Graceful as a Swan kit. Have a lovely day and think of me tomorrow that I will do well on that training. What a great, lazy, uneventfull weekend! Well, you can guess by the title of my blogpost, that it will be a rather short post hahahaha! But oh, how I enjoyed this lazy weekend, awesome. Friday I just did a few errrands and then was ready for the weekend. It started with watching the final of Popster, and it was very amusing and I think the right one is on 1st place, as well as 2nd. About the 3rd place Jan and I had some thoughts, but okay, it is not bad. Here the you tube video of the 1st place(they win € 50.000,00! Here the 2nd place, good for € 25.000,00 ! Hopefully you will be able to watch it, fantastic stuff. Saturday as well as Sunday, I did practically nothing, only a little quick laundry, and i did spend a lot of time at the computer, made a new kit, almost finished another one and further on I was a bit in the garden at times the sun was shining. It was nice, although still a bit chilly at times because of the northern wind. But it will change during this week, if all goes well, the wind will change direction and it will be SW or SE, and normally that brings better temperatures. Possibly also some rain, but that is a good thing for the garden. Today and tomorrow Heidi will be in hospital of Amsterdam, to have a thourough check. The last two months or so she is not feeling all 100%, and it doesn't seem to improve, it all has to do with her lung disease. Hopefully they will find something they can do(probably it has a lot to do with her medicins and the dose she takes). It will not be such a pleasant stay for her, because she will have to undergo lots of different tests and scans and all. It's a lung disease that is genetical, so nothing to do with smoking or such, which she never did, and it's already a great thing they have now medicins to keep it stable and "under control". I have not much on my to-do list today. Oh, I could do loads of things, but I just will pick out one or two and then I think I also will spend some time designing again. I am getting a bit short in freebies, and it seems I have got back "the flow", although not in too huge quantity LOL. Still we have to grab the moments, isn't that right? Today I have a nice kit, I believe, named "Graceful as a Swan". Yesterday morning I had another internship. I think it was okay, only one thing is wondering me. Although this kind of "class"is volunteerly I find it a bit strange that not everybody of the group is there all the time. I think that if you join you also have a little bit of responsability. So yesterday there were only 3 women( out of a little group of 6 I believe), and at the end Farida(the teacher) and I were left with one. f course they sometimes have important appointments to go to, but then I think it is only polite to let know that you cannot come. Hmmmm, I wonder how I would deal with that, if I in future would have my own group. It's also difficult for the teacher to hold on to the lesson , because not every one attended the explanatin and follow up. So next lesson she will have to re-do a bit the last lesson and go on to the next step, and then it is hard to get progress. But okay, not my problem at the moment, I will go there coming time and see and observe and help a little bit. When done there, I just made a little walk before going home, weather was nice, only it was a pity the wind blew from N and NW, so that made it feel colder. Still we have sunshine and I think we even will have to water our garden this weekend, because practically no rain is expected. Home again I first had a coffee and then I wanted to do some things but my eyelids didn't not really participate, LOL! So I took a nap and oh boy, that did me good! Consequence of it will be I will have to do some things today. I don;t mind, the sun is still shining and that already is a bonus. Jan is feeling slightly better( I think), but still has to be very careful in his moves and I guess he is still on a higher dose of his painkillers. There isn;t much we can do about it, so he will have to be patient ans hope it will slowly go better. Ahhhh, older age comes sometimes with defects, although you sometimes hear about people of 85 and older who still are completely healthy, mind and body and do all kind of things we already don;t think off anymore. Okay, no more ramblinig to do so I will finish my post with another freebie done by Florence. Have a splendid weekend be happy! Next few Thursdays will be busy. I had a satisfying day yesterday. I decided not to go to do some shopping, that could wait for another day and first do some household tasks. So I put on the washing machine and in the mean time I did some ironing, and it didn't take all too long. Then the sun was shining and it was nice outside, so I took a cup of coffee and drank it sitting in the sun. Finished with that we watched a little quiz on tv and then I could hang out the laundry. And then I spent some time working in the garden. No big jobs, mainly re-organizing the pots we have a lot of at the moment. Some of them have now a cover pot in a bright color, and it looks a lot better. Then I made some ground cover of pressed wood( oh that is marvellous stuff, you have a block of pressed wood and such, put it in a bucket with 1,5 ltr of water, wait for 10 minutes and you have ground cover), and that now is between the tiles of our path in the garden. It looks nice, and it helps supressing the growth of weeds. It just disappears after a few months, but that isn;t too bad. I can buy us some more blocks, it costs almost nothing. Oh, I had an email yesterday of the language coach basic training with the dates of the "lessons". Gosh, it starts already next Thursday afternoon and then 4 times in a row. That is a bit unhandy, cause in the mornngs I have to go to the internship. Hmmmm, Thursdays will be busy for a while. But there is just enough time between them for me, to have time to eat a sandwich, and such. Lucky for me the training isn;t far away either. I think I will be pooped out in the evening, because it asks probably a lot of concentration but okay, we will survive it with flair LOL! Today we will have another beautiful day, so we must take advantage of that. On the weather forecast they say, this will only last for today, may be still a bit tomorrow but then temps will go down again for a while. But as long as there is every now and then some sunshine and not too much cold wind, and a little rainshower at times, at least the garden will be rather happy. And I just feel more energy when I look out the window and see the sun is shining. That makes a big difference for your mood. Just have to give you one more link frm the show Popstars, you know, the puppet competition? This one has a place in the final too(which will be this Friday on tv). I found this one sooo good, very touching and after a few seconds, you just forget about the puppet player and your full attention is at the puppet, that seems to come to life and is the real centre of the act. Hopefully the video will work for you. If you want to see more, just take a look at the right side, there are about all the acts to see. 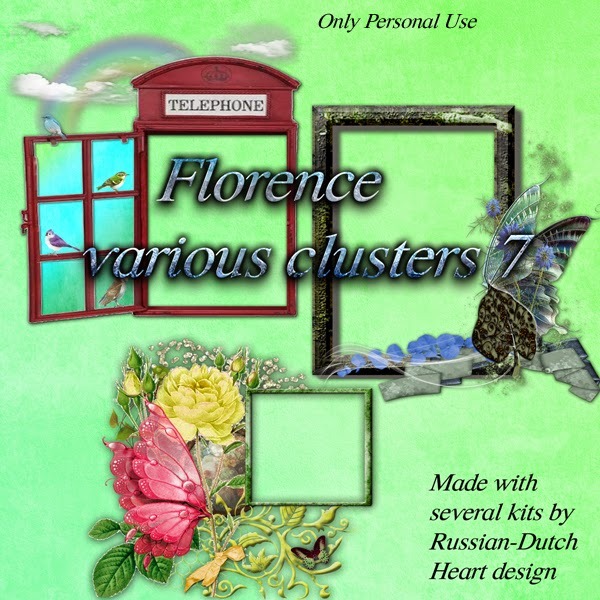 Now time for another freebie of Florence, some beautiful clusters. 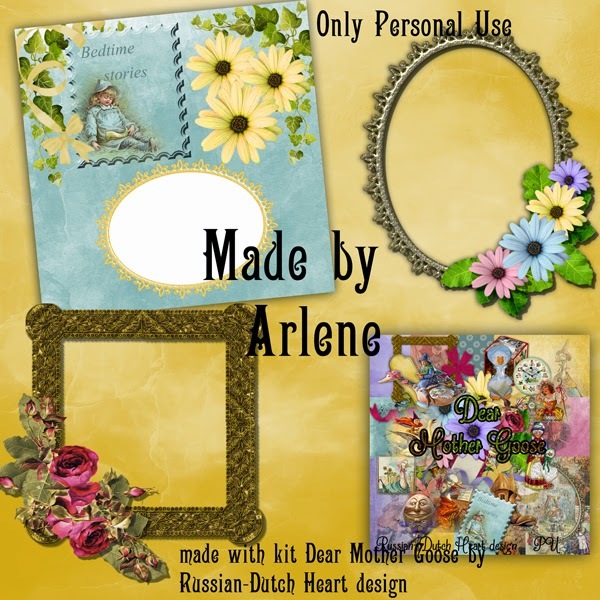 And if you're in for some more, go to Arlene's blog, she has some lovely new stuff and if you hurry, you still can enter a kind of competition and win a fabulous kit for free! Just comment on that post there, and may be you will be picked out as the lucky winner!!! Do it before Friday though! A real spring day in sight!! What about yesterday? Well, I went to join the little group for Dutch language lesson, right here in the neighbourhood and it was really nice. I had the impression the lessons would be much more complicated, but this traject is just to encourage women of other ethnical background to learn and try to speak more of the Dutch language. So it was pinpointed more to practice. The most difficult of giving these lessons would be to handle the difference in their knowledge of the Dutch language. Some already understand a lot, others have more difficulty but in general they are very willing to learn a bit more, and as I watched it yesterday, I could do a group already now.LOL. May be I will join the ame group again next week, if the lady teacher doesn;t mind. The hardest thing for me is to not interfere too much into the lesson, it's not my task, you know. The "lesson" took about two hours, longer than I have thought , but it passed so quickly. Finished there, I walked back home, because the weather was nice. as I came home, Jan already left for his appointment at the hospital with his gastrointestinal and liver specialist, and the results of the scan were good, and Jan told her about his operation. She didn;t know anything about it yet! You would think that they would communicate, but it seems a bit difficult. Strange. Anyway, she was glad to hear something will be done about the umbalicial hernia. As soon as he knows the date he must let her know and she will try to visit him that day. 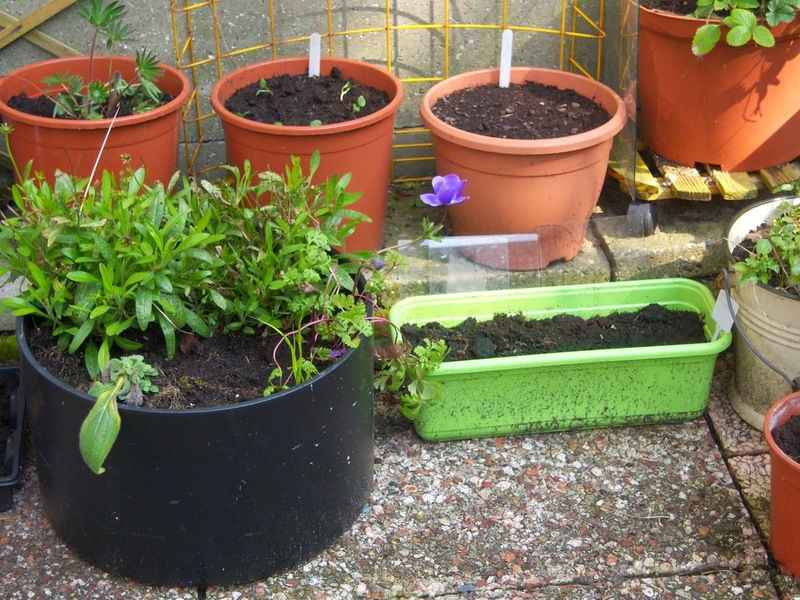 I did a bit gardening yesterday, with the nice weather. Some of the seedlings needed to be repotted already, so that was a nice and quiet job. 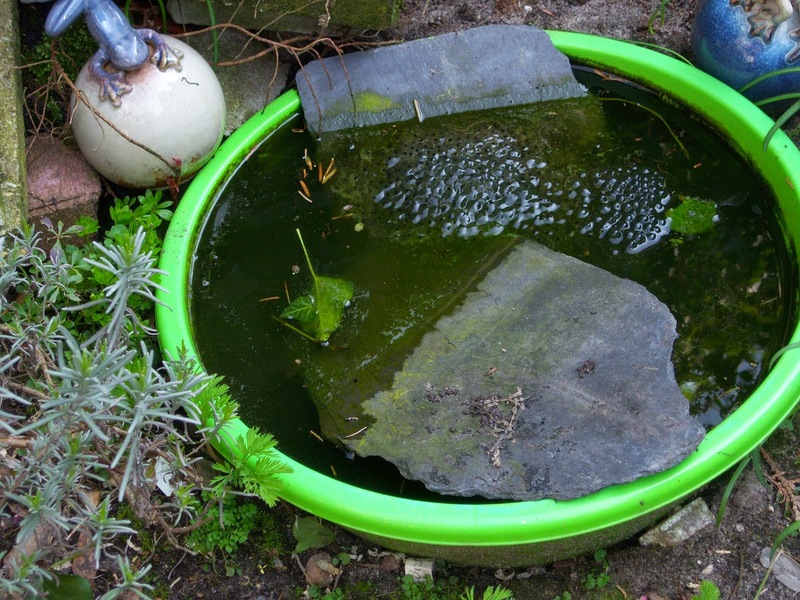 I have finaly made some pictures, and I have one of our little pond with the spawn in it! If the eggs all come out we will have a real invasion of little froggies LOL! And I have a couple of our "nursery". Not everything is sprouting already but some species really are sprinting! And I have a photo of a reagular visitor in our garden. 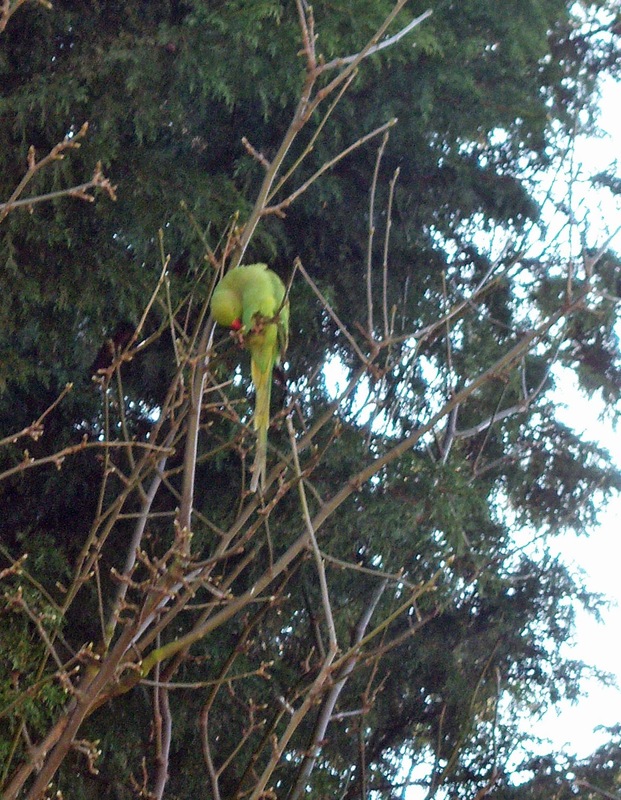 Sometimes there are five or six, sitting in the trees, this time I only spotted one paraqueet. Somewhere in the past they appeard in a parc nearby, and very often they come to our neighbourhood, and when in group they make a lot of noise talking to eachother, but I love them. Today the weatherman predicted us a real nice and warm spring day. Well, looking out of the window it really could be so. I see lots of sunshine and temps might go to ca. 68F! Wow, that would be really great, and if it all comes true, I think we will enjoy a bit of time in the garden, for the first time, sitting in a garden chair. Can't wait till early afternoon, when it should be best to do so. In the weekend it will be less good, may be even with some rain. But a little rainshower isn;t bad for the garden at the moment. and then I may be will be able to make some time the next few days to do something about the designing. It's about time again. 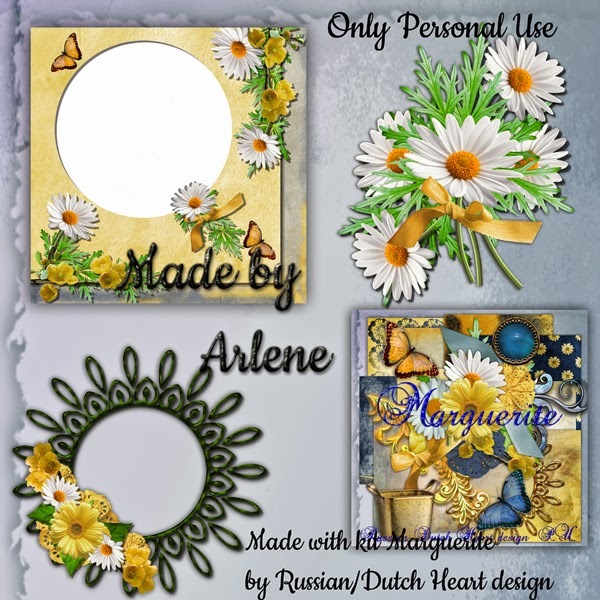 So, looking forward to a lovely day, I bid you goodbye for now, not leaving without a wonderful freebie from Arlene, mad with the kit Marguerite. Even for today a new appointment on the calendar. Remember that i told you that almost every day this week there is something on our calendar? Only today not(just a reminder thing for a birthday). Well, that has changed. Jan has today an appointment on his volunteer job place, he wanted to tell all that is happening with him at the moment in person to his coach there. So he will be leaving soon to go there, in the mean time I can do this post and then will go out to refill a bit the shelves in the fridge and the stockroom. Monday we had another lovely quiet day, and those two Easter days really did us some good. I even didn't spend much time at the computer that day, amazing! Yesterday I had gathered again some energy and did first a vacuum cleaning(much needed again), and in the early afternoon the sun came peeping out so I did a little work in the garden. 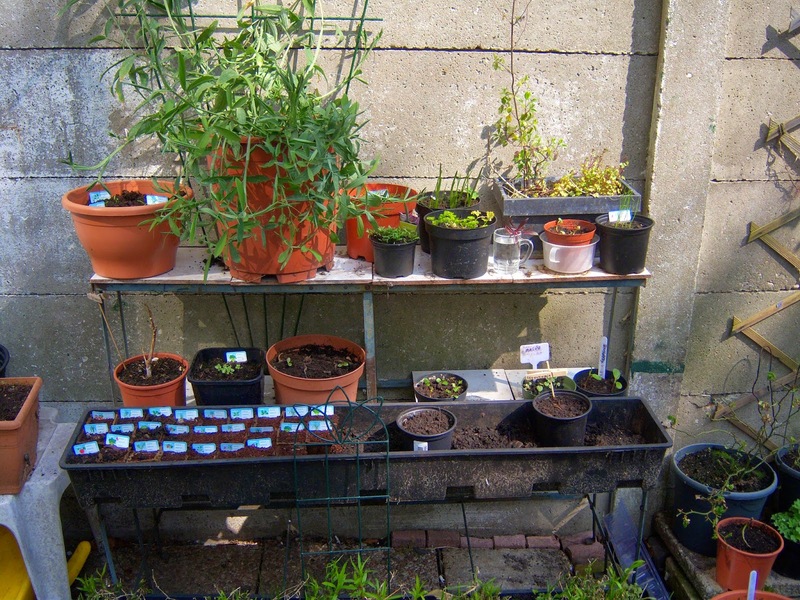 Some of the seedlings ahd grown quickly(although they are still real small) and could do with some more space. So I devided them a bit and have some of them in a bigger pot. Then i had to start making dinner earlier, because of the info evening I had to attend. I wanted to have dinner before, because I don;t like to have it too late, say after 20.30 evening. I made something simple, and left for the info at about 17.45. I was way too early there, but never mind. Was it interesting? In a way yes, but to my liking a bit too general. But I inscribed for the basis course and I will get info about the start of it. thought it never can hurt to learn something new and may be I will be able to do something with it. Anyway tomorrow morning I will be attending a "lesson hour"to see what it is actually all about. If we can believe the weatherman on tv Friday will be the best day of the week with temperatures around 62 F till may be even 68!!! And sunshine and bearly wind. Wow, I first want to see and experience it, but it would be wonderful. Then again temps will drop a bit, but okay, still not bad. Well, that's the news for today, hahaha, so we will skip to the freebie. 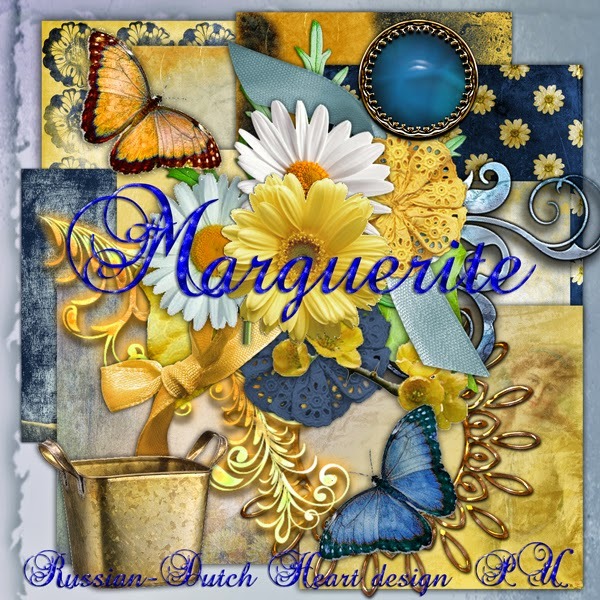 Another one of the "female names"serie, this one is "Marguerite". Till now our Easter Sunday is behaving well and was lovely. Saturday afternoon I just had to walk with the doggies, and so I did. The "guys"were all happy to be out for a moment and I was lucky with the weather. Sun was shining although the wind still was rather cold. That done I returned home with a bunch of little seedpots and seed Heidi left for me. They are coming from an actin from a supermarket, for every € 15,00 you spend there you get a little pot and seed( it is mainly for the children, to get familiair with a bit of gardening LOL). There are no flower seeds in the collectin, only herbs and vegetables, but that could be fun too. Jan planted them all and now we must wait till they sprout(or IF). I had some of these pots already some weeks ago and some of them are starting to show life! Yesterday was a lovely day. First we wer lucky that there was a lot of sunshine and even the temperature was a bit better. Specially in our garden, out of the wind, so Jan and I spent a little bit time there, re-arranging the pots and such, so now we have some space to put our chairs and little table. If we can believe the weather forecast, in the middle of this week wind will change from direction and will blow just mildly and temperatures should go up to even around 18 or 20 C!!!!! If that could be true, we would be very happy! Our pond lodgers are there already, and sometimes hopping through the garden. And as I looked to the pond yesterday i did a discovery. There was a clump of spawn floting on the water there, so if it all comes out, we should have a BIG family of frogs hopping around later this year. Great fun! after the time in the garden I prepared our dinner, which wasn;t all t much work. We wuld have a fondue, so I only had to cut the meat in small dices, make little minced meat balls, and we also had some chicken filet and mini sausages, and a couple of dip sauces, and french bread to go with it. I also boiled some eggs and made stuffed eggs for later that evening. We still have enough left over so this evening we will have the same dinner. I am not complaining! Hopefully we will have some sunshine today too, till now it is a bit grey and cloudy, but may the weather Gods will look mildly upon us and send some sunshine in the afternoon. If so we probably will do some more work in the garden. It would be great to have another day of quiet and peace, without thinking about anything like appointments, or bills or forms to fill LOL. Tomorrow real life will start again, with me going to the info evening for language assistent. Every day there is something on the calendar this week, only till now Wednesday if completely free, I only have to remember to call a friend who will have his birthday. Pffffff. Okay, I am going to enjoy my 2nd easter day, I think I will start with working a bit on a new kit and then hopefully the sun will be there. 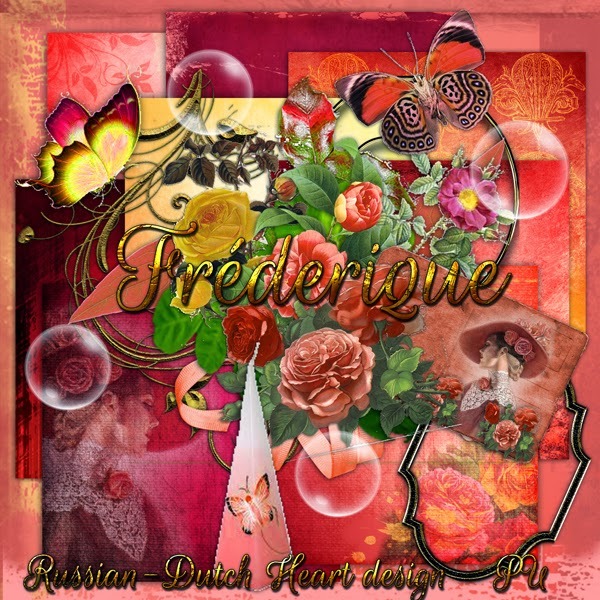 I have an add-on from Arlene for you made with the Fréderique kit. Jan just left for his scan in hospital so I have some quiet time to do my blogpost. Monday afternoon I went to the appointment with the volunteer/ participation coach( we have to do every few weeks one). It was nice and quick, I told him about the langiage information meeting next week, and he already had me planned for an "orientation lesson" with a teacher. Only it was for this Thursday morning and i told him I couldn;t make it because we have the appointment with the surgeon for Jan. It was no problem, now he scheduled me in next week. It seems to be a little group of women of foreign background, who want to improve their Dutch, and it is done by a proper language teacher( I think) and I will just look and hear how things are done. This language lessons are mostly directed on practical use, for every day things you encounter e.g. in a shop, with a doctor etc. I think it can be fun and rewarding. After the appointment with André(my coach), I walked on to the market, although the weather wasn;t all to good. But as I already was halfway, it took a short time to get there. I put some bills at my bank there and made a quick tour at the market. Came home with some fruit and a bit of veggies, and finally was glad to be home. Not long after it already was time to prepare dinner. Yesterday I finally finished a form I had to send with all copies they asked and posted it. Then i did some shopping at the supermarket, came hme, hanged out the laundry that I had turning in the washing machine, had a short computertime and gone was the day again. This morning up early to get Jan to his appointment, and I have a day"free". Not completely, always something to do in the house, but I am lucky I can stay in. There is still a hard wind blowing(yesterday evening at a point really storming with rain and some thunder), and on and off rain showers. No weather to be out if not necessary. Tomorrow up early to go to hospital again, till now nothing on the calendar for Friday(hoorray) and Saturday I promised Heidi to walk the doggies in the afternoon. she will be away with the family to her mother's and her mother isn;t so keen about having the doggies around. Next week we already have some appointments on our calendar, so at times it looks rather boring and quiet here and suddenly all kind of things appear at the calendar in a short time. To have nothing at your calendar isn;t always good, but too much isn;t always fun either LOL. You see, we people are never satisfied. The nly thing I really have to do within the next week or so, is re-organizing some folders, with all those new forms coming in, having to copy them, and now they need to be put back together with some other stuff relating to it. I promise I will do it, but only not today. No, I will give myself some playing time at the computer, later I will put on the stove a stew, that can linger there for a couple of hours, to give the meat the tender bite, and do some fun stuff in between. We had a look in the garden yesterday, at a time there even was some sunshine, and some of our seeds really are trying to do their best to show some green sprouts! Last Saturday by the way, we had a quick visit of Heidi and danny, who brought us a trunk for the garden, they didn;t want to have anymore. It's a real big one, where you can put in the pillows for the garden chairs, but I think we will use it for storage of garden stuff, like sme soil, and pots and tools. Specially the things you need all the time. We only have a little problem where to put it. We had in mind a great spot for it, but it just isn't big enough. Such a pity, it would have been a great spot for it. But perhaps we will put it on the patio, where we usually have our two chairs and little table, and can place it against the fence. And I thought it could perhaps make a nice seat in summer, put some pillows n it, so you have a soft seating and it will be on a sunny spot. Might be a good idea, we will try it out, only have to replace some pots to another place. 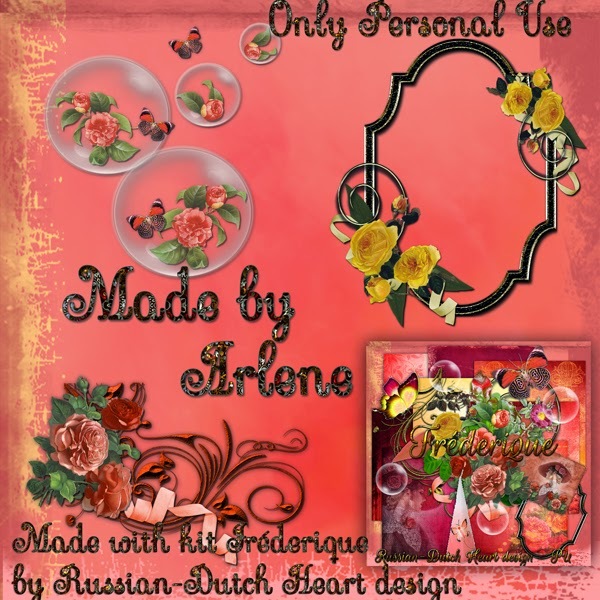 Okay, before we go to the freebie I want to tell you that Linda and Arlene have some awesome freebies for you on their blog. And now the add-on to the Dear Mother Goose kit, made by Arlene.